Public Deliberations in Technology Policy Making: a Report on Two Danish-Style Consensus Conferences in the U.S.
1In an age that has seen the expansion of democracy throughout regions of the world that have experienced only authoritarian, tyrannical governance for generations is one of the great achievements of the last decade of the 20th century. But within the celebrations of democratic expansion, there are aspects of our own democracies that beg for attention. 2Of particular importance to me is the challenge of developing policies about science and technology that are simultaneously technologically responsible and democratically responsive (Sclove, 1995; Dryzek, 1990; deLeon, 1997). Technologically responsible policies develop, deploy, and administer technologies in ways that take full account of the larger social, political, economic, and cultural impacts of the technology in question. For example, technologically responsible policies concerning civilian nuclear energy would include policies to administer the long-term handling of nuclear wastes. 3Democratically responsive policies, on the other hand, reflect the expressed desires of the general public. Some people hold that individual choices, when aggregated through markets, produce democratically responsive technologies. Others, myself included, argue that atomized, self-regarding choices cannot substitute for robust and substantive democracy. Democratic policies should reflect the considered judgment of ordinary citizens and allow them to steer technological change in directions that accord with their common and collective values. 4The achievement of technologically responsible and democratically responsive policymaking is made more complicated because of the evident gaps in knowledge between average citizens and the expert communities who develop new technologies and the policy makers who create the policies to administer them. It can often happen that the public demands technology policies that are not technologically responsible, as when NIMBY efforts inhibit efforts to responsibly dispose of hazardous or radioactive wastes. Likewise, the sponsors of potentially dangerous technologies often seek to evade democratic responsiveness through the concealment of relevant information or the subversion of appropriate popular scrutiny. 5One of the best-developed mechanisms for including non-expert citizen assessments of science and technology is the Danish Consensus Conference (Joss, S. & Durant, J., 1995; Joss, S. & Durant, J., 1995; Renn, Webler, Rakel, Dienel & Johnson, 1993; Renn, Webler & Wiedemann, 1995). Developed by the Danish Board of Technology (a research arm of the Danish Parliament), Consensus Conferences have been conducted for about fifteen years, covering a wide array of science and technology issues. At the behest of the Parliament, the Board of Technology organizes a Consensus Conference in order to elicit the informed, deliberative opinions of average citizens concerning a science/technology policy issue that the Parliament will face in the near future. 6A Consensus Conference involves recruiting about 12-15 average, non-expert citizens who will commit enough time (typically, three weekends about one month apart) to participate in a project of participatory public policy analysis. During the first and second weekends, the citizens are provided with background information about the policy issue in question, and are encouraged to discuss their concerns about the issue. 7They also generate a set of questions that they want content experts to address during the third, and final, weekend – the actual Consensus Conference. Content experts, reflecting a wide spectrum of expert opinion, would meet with the panelists, to answer the additional questions the panelists develop. This session is followed by an open-ended question-and-answer session with all experts and panelists present. 8After dealing with the content experts, the panelists – with professional facilitation – withdraw to deliberate about their recommendations. When the panel has completed its deliberations, and reached agreement about specific recommendations, a report is written that contains the groups’ policy recommendations and explaining their thinking on the issue. The report is then delivered to the Parliament, to the media, and to the public in an open press conference. 9With funding from the National Science Foundation and the Kenan Institute, a team at North Carolina State University conducted two Danish-style Consensus Conferences (called “Citizens' Technology Forums” –CTF) in Raleigh, North Carolina. We were – are continue to be – concerned that the most pressing public policy issues we face today so often involve science and technology, and that average citizens too often feel uninformed and ill prepared to contribute to finding solutions to those problems. We were interested in how ordinary citizens can participate more effectively in society's decisions about what technologies we want in our lives. We remain convinced that without significant contributions from ordinary citizens, these decisions will, by default, fall under the control of narrow, special interests, and that this undermines any claim of democratic legitimacy those decisions may possess. 10We decided that the Danish Consensus Conference model offered an especially appealing platform for our project. The Danish practice is well-tried and well-understood. One of our goals was to see if this practice can be successfully implemented in an American community in the traditional, Danish face-to-face format. But we also wanted to “push the envelope” by trying the practice on the Internet – this constituted the first time a Danish-style Consensus Conference was ever conducted entirely on the Internet. 11As we considered several specific technologies for our CTFs, focusing on genetically modified foods seemed especially appropriate. There is considerable interest in genetic engineering in North Carolina, the Research Triangle region has three major universities (North Carolina State University, the University of North Carolina-Chapel Hill, and Duke University) with significant genetic engineering programs and expertise, and over the preceding three years, at least five different countries (France, Switzerland, Norway, New Zealand, and Canada) had conducted separate consensus conferences on exactly that topic. This latter fact would give us a base for comparison for our CTFs. The development of genetic technologies presents a number of challenges for policy makers and for the general public; the application of those technologies to the general good supply of the nation raises fundamental issues of safety, equity, and public consent. This is precisely the sort of topic a consensus conference is designed to tackle. 12We recruited a committee of various specialists to help oversee the preparation of the background materials our panelists would read. This committee included a geneticist, a chemist, two historians of science, a sociologist (who specializes in genetically modified foods research), and a rhetorician (who specializes in public understanding of science). 13Dr. Robert Francesconi, an experienced, professional Facilitator, agreed to work with us on both CTFs. 14Participants were recruited using newspaper advertisements. Any volunteer who was employed by a company engaged in genetically modified foods production or distribution, or who was invested in such companies, or who was an active member of an advocacy group that had taken a position on genetically modified foods was excluded from participation. 162 persons responded to the advertisements, and 45 were selected for participation. 15Volunteers completed a survey, and were selected for participation based upon gender, age, ethnicity, and education to reflect the same characteristics of the general Research Triangle region of North Carolina. Three panels were assembled, two to participate in CTFs, one to serve as a control group. The first panel would work face-to-face (F2F), the second panel would work exclusively on-line via the Internet (K2K: “keyboard-to-keyboard”), and the control group would complete the pre-and post-test questionnaires, but otherwise would not participate in the project. 16By the time the three groups stabilized, they were roughly representative of the general population from which they were drawn, while being slightly older, slightly more female, slightly more African-American, and somewhat better educated than average. 17All three panels completed the same sets of pre-and post-test questionnaire. The questionnaires were intended to determine how much each group learned about the issue, and to assess various attitude changes that might be attributable to the experience. 18After exploring several options, we chose Facilitate™ as the software program for our Internet discussions. Facilitate is a distributed decision making software package intended for commercial use by large corporations, and it provided the best array of functions and controls for our purposes. 19For the K2K panel, we created a special Forum web site. At this web site, the panelists could review information about consensus conferences, read the background briefing materials, post personal descriptions or biographies, and access the Facilitate discussion space. 20A graduate seminar in technical communication, under the direction of one of our PIs, Dr. Carolyn Miller, was given the task of developing an issue background document, to be read by both CTFs. The document, 56 pages in length, outlined the history and evolution of genetically modified foods, discussed possible consequences of its deployment, and described the positions of various individuals, groups, and organizations. This report was accompanied by duplicates of a large number of government reports, NGO analyses, newspaper articles, etc., provided in a ring binder to all F2F participants one week before the first F2F session. The same materials were provided in html format at a CTF web page for all the K2K panelists prior to the start of their deliberations. 21The background materials were vetted by the Oversight Committee prior to release to the panelists. The Oversight Committee reviewed the materials for a) technical accuracy, b) political or ideological balance, and c) accessibility by non-expert citizens. The project team spent several hours reviewing the background document, line-by-line, to insure all three characteristics. 22The F2F panel met for three weekends (Saturday and Sunday for the first two weekends, Friday, Saturday, and Sunday for the final weekend) in conference facilities on the NC State campus. While the F2F panel met on weekends, the K2K panel “met” for three ten-day periods. During these periods, two or three two-hour synchronous discussion sessions were held (four two-hour sessions for the final period) and asynchronous “chat” was available between the synchronous sessions. 23Both panels were encouraged to introduce themselves and to disclose as much personal information as they, individually, chose. They were introduced to the facilitator and to the rest of the research team. They briefly discussed the history and purpose of consensus conferences, and what goals we were pursuing in the current project. 24Over the course of the first two weekends (for the F2F panel) or first two ten-day periods (for the K2K panel) they were encouraged, as well, to generate whatever personal concerns or apprehension they had about genetically modified foods. They were urged to discuss and review the background materials, and to collectively generate a set of additional information questions for the content experts. They were not encouraged during these first two phases to suggest specific policy recommendations, however. 25During the final weekend, the F2F panel met with a set of content experts recruited to answer the specific questions they generated. The experts prepared written versions of their answers that were distributed to the panelists prior to the expert presentations. On the first day of the last weekend, the content experts – one by one – responded to the specific questions the panel had generated. After this, the panelists met with all of the content experts for an open-ended question-and-answer session, where panelists could ask follow-on and clarification questions. Those same written responses were mounted on the K2K web site for that panel to read, and the K2K panelists shared a two-hour synchronous Q and A session with the experts. 26At this point, both the F2F and K2K panels launched into their focused deliberations. Various policy recommendations were proposed by panel members, and these were discussed, debated, and modified, as the panelists exchanged their views. Where differences of opinion emerged, the panelists were encouraged to do more than object to a specific recommendation; they were urged to propose alternative language that they thought everyone might be able to accept. 27Eventually, both panels reached agreement on the content of their panel reports and recommendations. These were put into final language and each group was asked to reaffirm their willingness to endorse the product. With this, the CTF ended. 28The results of both Citizens' Technology Forums exhibit a number of intriguing similarities and differences. We wanted to plumb the differences between the two modes along two cognitive variables (learning and decision logics) and two affective variables (trust and confidence). We expected that the two experiences would differ in important ways, especially because the K2K participants would deliberate in a very artificial environment. They would never meet or see each other, would never have the ability to judge another person's comments with the added signals of facial expressions, body language, and so on. Similarly, while the K2K participants would interact with the content experts, exclusively through words appearing on a computer screen, rather than in the more “natural” exchanges between the face-to-face group and the experts. Exploring these differences in the experience of group deliberations was central to our research project. 29Throughout, we hypothesized that the F2F group would outperform the K2K group on each of these dimensions. We had each group (F2F, K2K, and the control group) complete pre-and post-deliberation questionnaires that sought to measure changes in these four areas. We also coded and analyzed some 2,500 pages of transcripts of both groups. 30We recognized that our sample size (n=26) was too small for statistical significance, and that attitudes of the sort we were interested in change slowly over a lifetime. Nonetheless, our results, while only suggestive, proved interesting. 31There was significant content learning experienced by both the F2F and K2K groups. There were no significant difference between F2F, K2K, and control groups in overall trust and confidence measures. Change in trust for K2K (but not for F2F) is negatively correlated with learning: as learning increases, trust decreases. For F2F, additional significant differences between pre-test and post-test in overall trust and goodwill as component of trust. 32Although our small sample size makes statistical conclusions difficult to draw, we believe that the limited results of our work tend to disconfirm our hypotheses: the K2K group performed as well as the F2F group, and the Internet can serve as a platform for serious citizen deliberation on complex issues of public policy. 33There may be aspects of deliberation in which the K2K group actually outperformed the F2F. For instance, a preliminary analysis of transcripts suggests that the K2K group may have done a better job of integrating minority positions in the final consensus report than did the F2F group. This is thought to be associated with the relative dampening of interpersonal tensions characteristic of the computer-mediated communications (Macoubrie, 2002). 34Although both groups worked in isolation from each other, both had very similar lists of concerns about genetically modified foods. These areas of concern reflect the wider public debates about genetically modified foods, and that two separate groups would generate such similar lists should reinforce for the sponsors of genetically modified foods and for governmental decision makers just how important these concerns are to average citizens. 35Both groups spoke of the potential economic benefits of genetically modified foods, but both were concerned with the rapid development of genetic engineering, and the unpredictable consequences of its deployment. They both worried that the long-term health effects of genetically modified foods were unknown, and they were dismayed by the apparent lack of mechanisms to track those effects. 36Both groups were concerned that genetically modified foods were introduced into the general food supply with little public comment, and they expressed a strong desire to see that consumers are provided with more extensive information about such foods. Both groups endorsed strong programs of public education to overcome the lack of unbiased and reliable information. 37Both groups argued that citizens should have the option of consuming nongenetically modified foods. 38Both the face-to-face and the Internet panels were worried about the potential environmental impacts of genetically modified foods, especially on other forms of agriculture, including organic farming. Both wanted the government to take steps to assure the preservation of non-genetically modified seed stocks. 39While both groups agreed that some form of labeling for genetically modified foods is necessary to insure public choice, they disagreed on the feasibility of segregating genetically modified foods within the larger food stream, and differed about the application of the European Union's “precautionary principle” to the bio-technology industry. The precautionary principle halts the regulatory approval of new foods if there is insufficient, inconclusive, or uncertain scientific data concerning potential risks. 40Both groups worried that the regulatory structure to oversee this new technology was fragmented and uncoordinated, and both thought that a review of the regulatory structure that is responsible for genetically modified foods was necessary to improve regulatory effectiveness. 41We sought participant reactions to the consensus conference experience among the K2K participants (Prosseda, 2002). The panelists were asked to rate the experience on a 10-point scale (1= “extremely difficult”, 10= “very easy and rewarding”), with an average rating of 7.9 (based on 11 responses). Eight of the panelists thought that the final report accurately represented the group consensus, although one participant objected to the completed final report. 46Others noted the convenience of being able to engage in deliberations from home, a relief from having to respond immediately, and the ability to break the work load into more manageable two hour segments. 53Other concerns included the experience of feeling “rushed” in the final report preparation (an overtime session was required in both the F2F and the K2K sessions), and the lack of a “white board” on the web site so that the entire final report could be viewed as it emerged. 54The team has begun the second phase of this research program. Again with funding from the National Science Foundation, we are, in the first year, running six K2K CTFs, this time examining climate change and global warming. We have two main goals: we want to expand the statistical base of our research and we want to test some facilitation moves that we found useful in the first K2K panel. Specifically, we want to see whether those facilitation moves prove as useful in multiple CTFs and we want to see if some of the facilitation tasks can be “delegated” to the panelists, themselves, to perform. 55In the second year of the grant, we will organize two more CTFs, also examining climate change and global warming. These CTFs, however, will be run in a “Mixed Mode” format, i.e., part of each panel's work will be conducted F2F and part conducted K2K. 56With the completion of the second phase, our team will have conducted a total of ten CTFs. 57The third phase of our research program will involve organizing a national distributed-coordinated Citizens' Technology Forum. We expect that such a CTF will be run in MM, rather than K2K only, since we expect that Internetonly deliberations will be less effective than deliberation that includes face-to-face elements. 58Deliberative exercises tend to come in two varieties: small-scale and large-scale, and there are advantages and disadvantages to each format. Small-scale deliberations have the benefit of greater opportunity for the participants to get to know each other, to develop a sense of common purpose and trust. In small-scale deliberations there is a greater chance that each participant will come into close contact with individuals who have different perspectives than their own, and that, therefore, the output of the deliberations may more effectively integrate diverse positions and perspectives. 59On the other hand, small-scale deliberations face the challenge of representativeness. Their small size works against their work being perceived as reflecting the considered opinion of much larger populations. Large-scale deliberations are better able to claim widespread representativeness and avoid the marginalization that can accompany small-scale deliberations. On the other hand, large-scale deliberations face the challenge of assuring that all participants encounter the diversity of opinion and perspective that small-scale exercises achieve. It is also the common experience for large-scale deliberations that problems of logistics and organization press toward a shorter period of time for the deliberation, typically a single weekend. Small-scale deliberative exercises face fewer logistic problems and can – as is the case with Danish Consensus Conferences – significantly expand the time during which participants engage in discussion, debate, and deliberation. Extending the deliberation time permits each participant more opportunity to consider and reflect on the other perspectives heard during the deliberations, and to allow one's own thinking to mature and become more nuanced and sophisticated. 60In the national phase, we hope to be able to gain the advantages of both large-scale and small-scale deliberations. We hope to be able to combine – using a Mixed Mode approach on the Internet – a number of independent, small-scale, local deliberative exercises into a coherent and coordinated national deliberative effort. 61Our plan is to recruit faculty on several – six to eight – campuses across the U.S. who will be willing to organize local CTFs on their campuses. This would give us 90 to 120 potential participants from a wide array of states. Each of these local CTFs would examine the same issue, all of their participants would read the same background materials, and – using satellite hookups – interact with the same set of content experts. 62While each CTF would work independently from the others, at various points in their deliberations, all of the panelists would “convene” via the Internet. This would allow citizens in, for instance, Arizona, to hear what citizens in Michigan or Florida are thinking about, what their concerns and issues are. As each group continues its deliberations, there may be opportunities for the diverse groups to exchange drafts of recommendations, and so on. Thus, we would have the advantage of small-scale, local, face-to-face deliberations, on the one hand, and the advantage of large-scale, national considerations. 63Each CTF would, in the end, deliberate to its own, separate report and sets of policy recommendations. We would expect these recommendations to overlap, perhaps quite a lot. And they could reasonably claim to reflect a nationwide, informed citizen opinion on the issue in question. To the extent that the separate reports and recommendations differ, this might provide useful insights into regional differences, and could be the focus of additional research projects. 64Consider the impact if deliberative practices such as these were to become institutionalized. In the U.S., we have 50 separate land-grant university systems, with over 100 land-grant campuses. Land-grant campuses have a statutory obligation to “bring expertise to the people.” Imagine if just, say, six land-grant campuses joined together each year to conduct a National Citizens' Technology Forum, using our Mixed Mode approach with the Internet. And the following year, a different set of campuses did the same, and the next year another group, and so on (Hamlett, 2000). 65In a relatively small number of years, the numbers of average citizens who have the experience of studying a complex public policy issue, of having access to the best experts, and the chance to discuss what kinds of public policy responses make the most sense to average people would grow substantially. By the same token, the number of citizens who feel intimidated by complex science and technology issues, who feel either cowed or cynical about “experts”, and who think of themselves as “not qualified” to speak out on complex issues would shrink. 66Policymakers would have access to a new voice in the policy stream: the opinions of average citizens who have actually studied an issue and have tried to devise policies they believe will best serve the public interest. This won't solve problems like campaign finance reform, of course. But an informed citizenry willing to avail themselves of the research resources that they pay for with their taxes are less likely to stand mutely aside while special interests dominate policy making. Such developments won't solve all problems, but they might be a small candle lit against the darkness. Deleon P. , Democracy and the policy science, Albany, New York, State University of New York Press. Dryszek. J. S. , Discursive democracy: Politics, policy and political science, New York, Cambridge University Press. Hamlett P. W. , Bringing expertise to the people: Universities and citizen deliberation in the making of technology policy, Proceedings: University as a Bridge from Technology to Society: IEEE International Symposium on Technology and Society, Rome, Institute of Electrical and Electronics Engineers. Joss S., Durant J. (Eds.). , Public participation in science: The role of consensus conferences in Europe, London, Science Museum. Joss S., Durant J. , The U.K. national consensus conference on plant biotechnology, Public Understanding of Science, n° 4: 195-204. Renn O., Webler T., Rakel H., Dienel P., Johnson B. , Public participation in decision making: A three-step procedure, Policy Sciences, n° 26: 189-214. Renn O., Webler T., Wiedemann P. (Eds.). , Fairness and competence in citizen participation: Evaluating models for environmental discourse, Boston, Kluwer Academic Publishers. Sclove R. E. , Democracy and technology, The Conduct of Science Series, New York, The Guilford Press. HAMLETT, Patrick W. Public Deliberations in Technology Policy Making: a Report on Two Danish-Style Consensus Conferences in the U.S. In : La situation délibérative dans le débat public : Volume 1 et 2 [en ligne]. Tours : Presses universitaires François-Rabelais, 2004 (généré le 20 avril 2019). 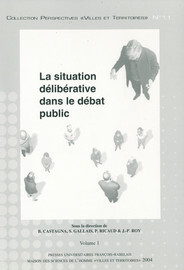 Disponible sur Internet : <http://books.openedition.org/pufr/7183>. ISBN : 9782869065000. DOI : 10.4000/books.pufr.7183. Hamlett, Patrick W. “Public Deliberations in Technology Policy Making: a Report on Two Danish-Style Consensus Conferences in the U.S.”. Castagna, Bernard, et al.. La situation délibérative dans le débat public : Volume 1 et 2. Tours : Presses universitaires François-Rabelais, 2004. (pp. 105-117 -Vol. 2) Web. <http://books.openedition.org/pufr/7183>.